Which of these comics is most relevant to your practice of martial arts? I would say the “FunBot” …..sometimes I have to remind myself that training is meant to be fun as well. I let the competitive nature and hard-non-stop training shadow the fun part! I love the “fun bot” cartoon—hilarious! Love the Food Fight Fattie. Is that what they call “getting a clip on the ear”? Skeleton Clown: he learn’t to be a clown so he could be funny, but he didn’t change what he was. This is probably the most cynical one because the symbol of the skeleton suggests he can never change. 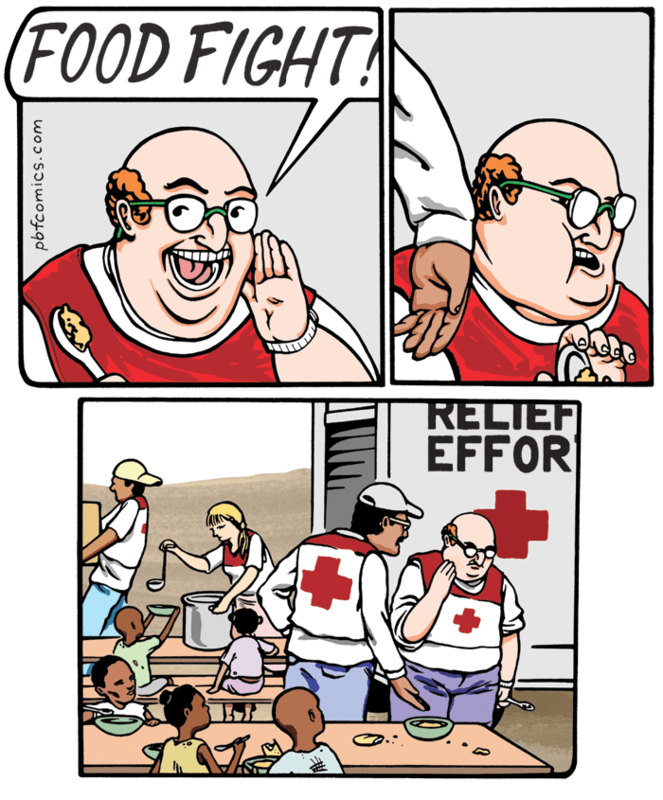 Food Fight: while helping others he tries to make things fun in the wrong way. Funbot: A destruction of all things colourful. Wise Sensei: THIS IS THE MOST IMPORTANT ONE. so many times I’ve seen this. The students don’t want to “learn” per ‘se they just want the teacher to know how good they are or gain a congratulations for what they are. They ask their teachers questions but really they have their own answers and just want to be seen as deep or wise. So much pride. Good replies. Here are some of my thoughts. I don’t think we know whether a walking skeleton is capable of changing its nature. But it is clear that, without doing so, it is not suited to working as a birthday clown. This comic reminded me of so many people who seek to learn “martial arts techniques”, for self-defense, or self-confidence, or fitness or whatever reason, instead of addressing the underlying issues that most directly place them in danger, depression, disease, etc. There are situations when combat is not any kind of solution, but will only make things worse. The soup kitchen in a refugee camp is a perfect example. These should not be taken as opportunities to express one’s pride in their (food) fighting prowess. The world’s most boring Dad can shoot laser beams out of his eyes, but even his own son didn’t know it. Until Dad was accosted by a giant intimidating robot. The moral of this short story is, don’t be the robot. There are many ways to deconstruct the Wise Sensei. Who is the greater fool here, the teacher or the student? Can’t say, but at least the student is smiling.